If you're like me, you can't get enough Brené Brown! I love her books, Ted Talks, and her videos on Oprah's SuperSoul Sunday. And I especially love all of the inspiring Brene Brown quotes. She offers such wisdom, truth, and authenticity on difficult subjects like shame, vulnerability, and self-acceptance. I'm sure you'll find a few that inspire you or maybe even push you out of your comfort zone with an ah-ha moment. 1. "What we don't need in the midst of struggle is shame for being human." 2. "What's the greater risk? Letting go of what people think - or letting go of how I feel, what I believe, and who I am?" 3. "The truth is: Belonging starts with self-acceptance. Your level of belonging, in fact, can never be greater than your level of self-acceptance, because believing that you're enough is what gives you the courage to be authentic, vulnerable and imperfect." 6. "I don't have to chase extraordinary moments to find happiness--it's right in front of me if I'm paying attention and practicing gratitude." 7. "Those who have a strong sense of love and belonging have the courage to be imperfect." 9. You either walk inside your story and own it or you stand outside your story & hustle for your worthiness." 10. "Daring to set boundaries is about having the courage to love ourselves even when we risk disappointing others." 11. "We don't have to do all of it alone. We were never meant to." 12. "You're imperfect, and you're wired for struggle, but you are worthy of love and belonging." 13. "Shame is the most powerful, master emotion. It's the fear that we're not good enough." 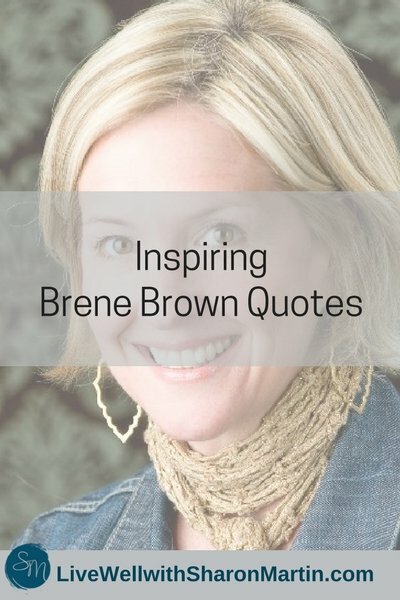 Which is your favorite Brené Brown quote? Go ahead and share it! Great compilation, Sharon! I love Brene Brown. She always makes me feel more peaceful. Yes, she has a way of really speaking to the human experience.